Salad spinners aren’t just for leafy greens anymore. This week we plastered our salad spinner with a rainbow of colored paint. We made inexpensive Halloween decorations with it. We learned science with it. We spent over an hour spinning and spinning and spinning until our arms and our imaginations were exhausted. We made spin art spiderwebs. When I read Babble Dabble Do’s article about Rainbow Spin Mixing I was honestly inspired. I immediately bought myself a salad spinner and anxiously anticipated creating colorful spin art of our own. Do you know how many one-of-a-kind projects you can create using a salad spinner? Meri Cherry made spin art rocks and the Artful Parent made a variety of colorful spin art crafts using paper plates. The possibilities are endless! 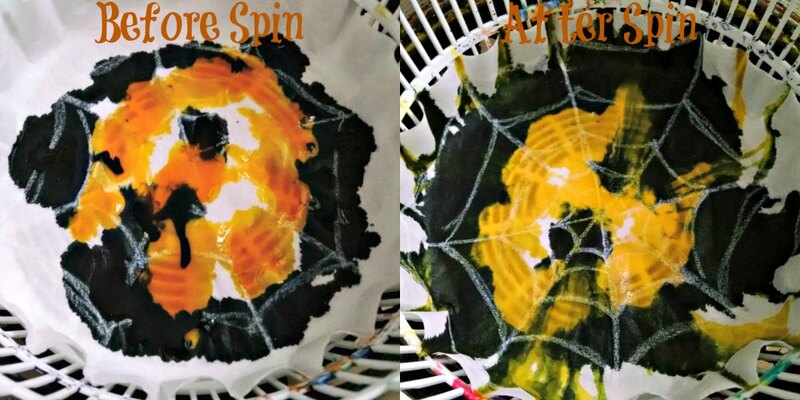 Since we are so close to Halloween we felt inspired to make spin art spiderwebs to hang in the windows. They complement our squishy window gels and our glow in the dark window gels so well I’d say we are all ready for Halloween! Coffee Filters – These inexpensive filters are fantastic for a variety of art and science activities such as Marker Chromatography. Liquid Watercolors – We use these for everything from making window gel clings to coloring naked eggs. Salad Spinner – This is the cheap one we bought. IKEA! Use the white crayon to draw a spiderweb on the top coffee filter. You can do this freehand, or if you are artistically impaired like me, print out this spiderweb and trace it. Center the coffee filters in the basket of the salad spinner. Add your paint! Since we are using watercolor paint for this activity it is extremely runny. Don’t worry, those pools of paint you see will dry out after you spin spin spin! Close the lid of your salad spinner and give it a good whirl! Open up your salad spinner to see your spin art! Add more colors if you wish, or pull the coffee filters out and lay across paper towels or newspaper to dry. We hung our spin art spiderwebs in the window for decoration. You could also make a mobile, tape it to the wall, or hang it outside! 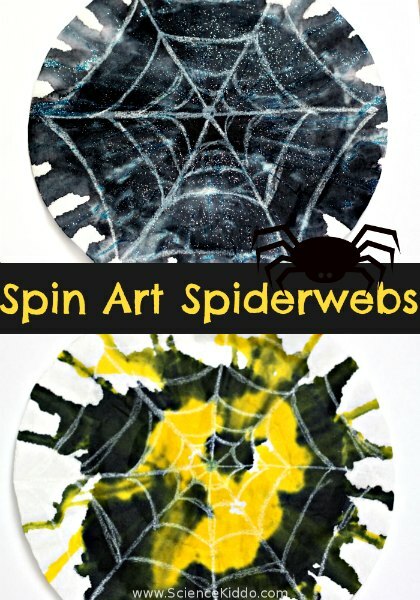 Spin Art Spiderwebs: Science AND Art! Wax Resist Art. Notice that the pattern you drew with the white crayon repels the liquid watercolors. This is because wax crayons are made of different chemical bonds than the liquid water colors are. The two won’t mix! You can see this same science in action by making color bombs or constructing a lava lamp! Color Mixing. By using just two or three primary colors, a variety of colors can be produced as they mix! Talk to your kids about the new colors they see as their spin art emerges from the salad spinner. Centrifugal Force. Though not a real force, this describes how an object flies out from the center when following a curved path. When doing spin art the colors get pushed from the center to the outside as the salad spinner rotates. This makes the colors mix and gives you a beautiful SPLAT pattern! 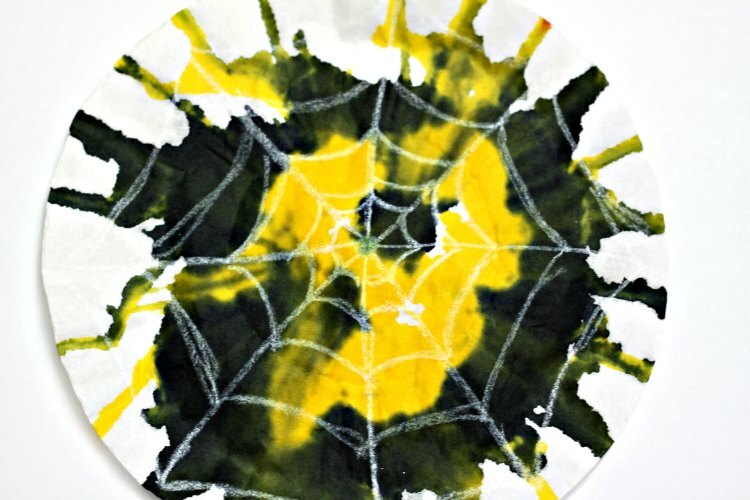 If you love making spin art spiderwebs and are craving more spider-themed fun, be sure to hop over to From Engineer to Stay at Home Mom for 16 MORE spider STEM activities! We did salad spinner artwork a couple of weeks ago. All my kids loved it. I never thought about using coffee filters. They are already the perfect size. I had to cut our paper down to make it work. 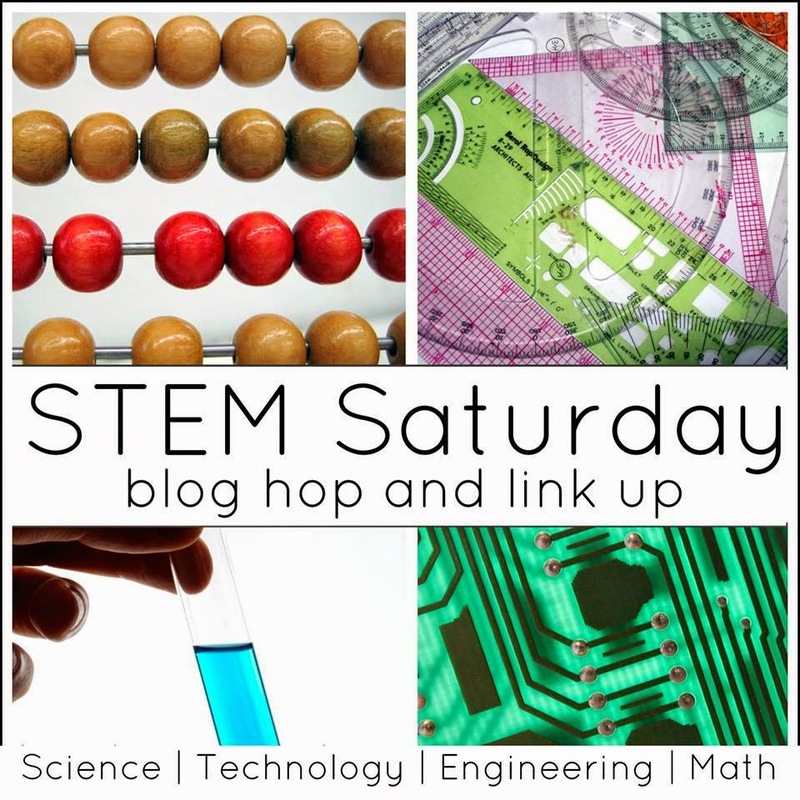 Thanks for linking up at Made for Kids! Instead of spider webs, I am going to try their names with the white crayons on the coffee filters. Just for art work in general. Thanks for the idea.